This is a one-sided 12" EP of instrumental songs about suicide. In the tradition of what are typically referred to as "tone poems" (http://en.wikipedia.org/wiki/Tone_poem), each song is an attempt at evoking a different suicide scenario and is named for the location in which the imagined suicide has taken place. To achieve this aim, Clark's compositions range from gloomy organ arrangements, to tempo-shifting heavy metal tracks, to echoey solo-piano works, and even frenetic multi-instrumental compositions with a feel of early 20th Century Modernism. Although this release will prove inaccessible to many listeners due to both its subject matter and its trans-genre nature, those interested in music-for-music's-sake are likely to find something of real interest and worth in this limited-edition EP. Each EP is hand-numbered and comes with an .MP3 download card with links to two additional remix tracks not available on the vinyl. 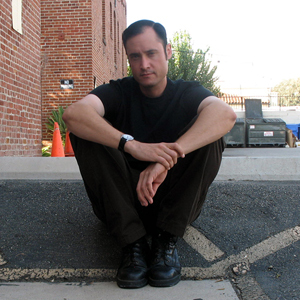 Brian M. Clark is a writer, interviewer, musician, and archivist of "Unpop" culture. He runs the Discriminate Audio label and has produced or co-produced albums by Chthonic Force, Giddle & Boyd, Little Fyodor, and Ralph Gean. Brian appears on Giddle & Boyd's Going Steady With Peggy Moffit EP, and is presently working on a project called Unborn Ghost. "A surprisingly fun record that is good to put on when you're feeling suicidal." "[These songs] shimmy from creepy carnival calliope to detective show jazz to industrial cacophony... Despite the downer theme you’ll find this oddly upbeat and inspiring." "On looking at the title, my first impression was, 'well this should be a complete downer.' [but]… Overall this is an interesting album and takes on the subject matter in a much more interesting manner than I expected. I especially applaud the instrumental approach rather than just going for the easy way out with vocals or samples." 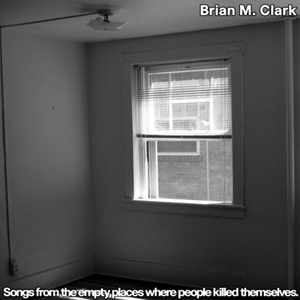 "Brian M. Clark executes perfectly disjointed imagery and sound on his one-sided 12", Songs from the Empty Places where People Killed Themselves. This disjoint is pervasive, starting from the exploitation of the listener's expectations… Viewing the artwork, project title, and song titles (and descriptions), Clark places the listener's mind into a morbid realm, populated by despairing characters and true violence... This set of artwork, song titles, and character descriptions perfectly offsets the music from the morbid atmosphere. In fact, the music is bright, nearly cheery, and it waltzes along according to bass or organ lines that serve as a foundation or continuous theme for the songs… Clark confronts his listener with striking images and situations of true despair and violence, only to offset those images and situations with spaces that endure according to a completely different feeling. A true disjoint, ultimately allowing us to think about the endless perspectives that place our psychological expectations against physical realities. Spaces endure, even as our imagery and expectations pull us in another direction; Clark effectively and even playfully executes this contrast in musical terms." "This is an exercise in program music – four instrumental songs crafted to impart thematic intent upon the listener. I want to frame the declamatory nature of this with 'Death of the Author' and the assertive naiveté of abstract painting, but the margins here are narrow... Considering the source, this record is more genuine, more direct, than a didactic monolith for darkness’s sake." "This mood music is not what you expect… That's what's good about this. Songs From The Empty Places Where People Killed Themselves doesn't impose a rigid reading. There's the track title and a brief description of the suicide scenario, but from there on it's up to the listener to fill in the detail, as brutal or banal as you care to make it… At the hands of Brian M. Clark, suicide has never sounded so groovy." "Songs from the Empty Places Where People Killed Themselves is supposed to mimic the memory of the event, not the event itself — a haunting glance into frozen tragedy from the mind of someone who understands the subtle humor behind the fleeting, temporal nature of existence and can perhaps find some level of comfort within it." "This one-sided LP, four tracks, is Clark’s first solo record... The first two pieces are very filmic, with marimbas, pianos and percussion, gentle and vibrant, almost like a classic modern score to film. The third piece consists of the howling of guitars, while the closing piece is a very contemplative piece of sparse piano, guitar and sustaining sounds. I thought it was pretty stuff actually... In hindsight it's of course not easy to say if they sound like [tone poems] dealing with suicides, but perhaps they don’t. It's like an umbrella concept hanging over the record. You could also, as easily perhaps, state that these are four great soundtracks to imaginary films. Very nice." Brian M. Clark - "Suburban Bedroom"
Brian M. Clark - "Studio Apartment Bathroom"
Brian M. Clark - "Suburban Basement (Lithium remix)"